CN's east yards in the 70's. Quite a difference compared to 2015! 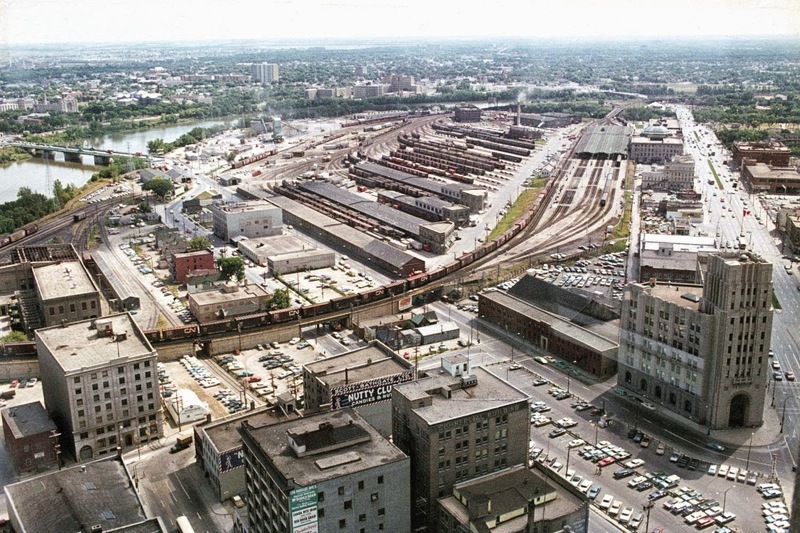 It's been 25 years - an entire generation - since The Forks opened to the public, changing what was once CN's bustling downtown rail yard into Winnipeg's premiere meeting place. The Forks is now home to the Canadian Museum for Human Rights, the Winnipeg Goldeyes, The Winnipeg Children's Museum, and dozens of shops that are housed in some of CN's structures. WMRC member John Longhurst takes a nostalgic and informative look back at the CN donwtown east yard in an article he wrote for his blog, The CP Rail Manitoba and Minnesota Division. Long time WMRC members will recall fondly when we used to meet in the basement of the Via Rail station when the CN yards were still in operation. Later, we held meetings in the Children's Museum after The Forks was established. Now we're back at The Forks, operating the Gateway Western layout in the Winnipeg Railway Museum! The Manitoba Mega train Show has a new location!